Belial is an expert at using multiple weapons. He is usually armed with his powersword and powerfist. He may choose to use his plasmapistol in the shooting phase, and if he does so he can always fire twice regardless of movement. However if he gets into close combat on the same turn, he will not be able to use his mc powersword. Belial's reflexes are superior to even those of a normal spacemarine and he reacts with superhuman speed. Enemy models do not get +1 attack if they charge Belial. If the enemy's initiative is higher than Belial's they will regardless strike at the same time. Belial hates orks for their blasphemy in Piscina IV. Belial and his command squad will always move forwards 6" if he is facing an ork army. Belial has led the third battle company since his ascension to its command following on the foot steps of Gabriel. His brilliant tactical defence, use of limited resources and final counter attack that destroyed the combined forces of ork warlords Ghazhkull thraka and Nazdreg will go down in dark Angels history as a scintillating example of their battle prowess. 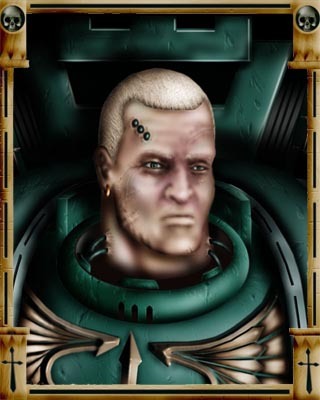 An oft forgotten fact is that had the Dark Angels not thwarted Ghazhkull's plans, his second invasion of Armaggeddon would have come much earlier to the distinct detriment of the Imperium. Belial took over the third company from Gabriel as the latter moved on to command Deathwing. Captain of the Dark Angels third company. Belial led the Dark Angel defense and subsequent counter attack against Ghazhkull Thraka at Piscina IV. Wargear: Powerfist, master crafted powersword, plasma pistol, iron halo, frag & krak grenades, melta bombs, terminator honours, stubborn.